I keep going on and on about this point, but it isn’t easy to come by Tomicas in the UAE. I was having that discussion with the co-founder of the company I work for, and he mentioned a little-known store located in a forgotten corner of a city. He told me he remembered them stocking Tomicas there, and I should give it a shot. So on a dull Saturday afternoon, a friend of mine and I decided go looking for the place. I mean, it’s not like we had anything better to do. So we drove around for about about an hour looking for the place, only to find out we’ve shown up at the wrong building. Close, but not close enough. So we circle round to the right building, and find out there’s next to no parking. We then spend another 25 minutes looking for parking. We’re close by, we’re parked, everything’s great now, right? Well not quite. Seems the store has the strangest our hours every. It opened at 4PM, and it was only 3PM. So we walk to a nearby burger place to kill some time, and nourish ourselves (6/10 on the burger, good not great), then head back. With the shutters up, the place looks full of promise. There are Tamiya and Revell posters everywhere, and of interesting cars too (FJs, Porsche 928s, etc). 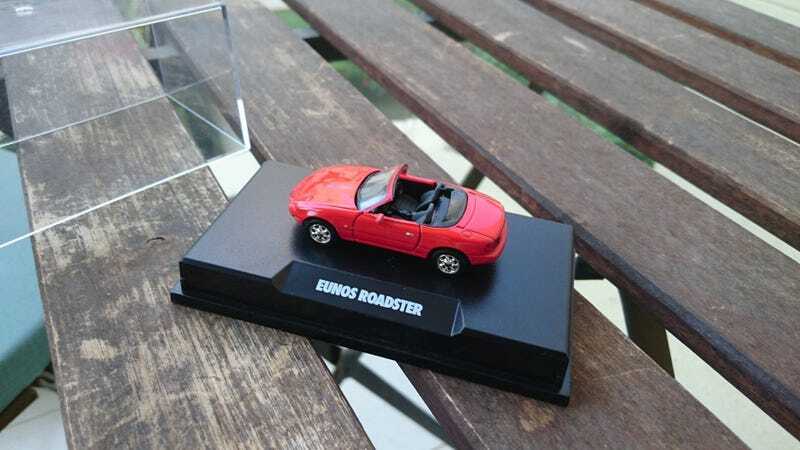 We walk inside, and immediately spot a few boxes of Tamiya Collector’s Club Mazda Eunos Roadsters sitting there. Definitely in the right spot. The tip was good...or was it? Other than an ancient 1/18 Revell Audi TT coupe, there wasn’t much else in the shop. Mostly R/C cars and model kits (and there are places with much better stock around town for those). The shop was charming, but it looked like it had seen better days. I wasn’t leaving empty-handed though. I grabbed the Eunos on the way out, paid the man about $12, and was happily on my way. I’m completely unfamiliar with Tamiya Collector’s Club cars, but I’m pretty impressed with the quality. Fit & finish is top notch, detailing is excellent...it’s one of the nicest 1/64s I own (rivaling my Tomica Limited Vintage Toyota Century). If you know more about Tamiya Collector’s Club cars, I’d love to learn more. Or I could stop being lazy and just Google it.